Symbols are always important in conflicts and South Sudan is no exception. 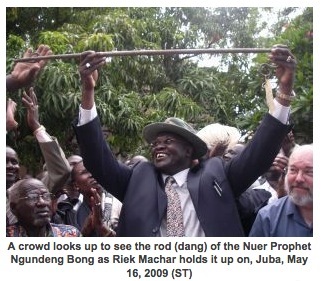 The symbol in the conflict now raging between Salva Kiir and Riek Machar is the rod (or ‘dang’) of the prophet Ngundeng Bong, the most famous of the Nuer prophets, who lived more than a century ago. The words of all prophets are open to interpretation. Ngundeng was himself bearded (unusual for Nuer at the time) and left-handed, so contemporary references to bearded and left-handed men were to himself. Ngundeng’s prophecies are believed to have suggested the following: That Sudan would be split by war. A heavily bearded man would relinquish power and a left-handed Nuer would raise a new flag of an independent country. According to this interpretation the heavily bearded man is Salva Kiir and the left-handed man is Riek Machar. But were these prophecies made at the time, or are they modern inventions? This story that has been given impetus by Machar’s determination to get hold of and retain Ngundeng rod, or dang. 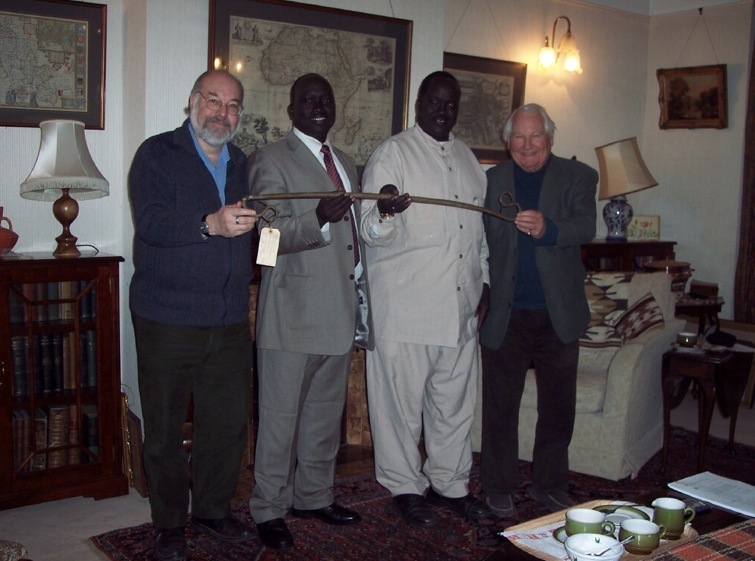 In this article the historian, Douglas Johnson, explains the importance of the rod, how it was taken by the British, how he brought it back to South Sudan and how Machar obtained it. Ngundeng Bong, the most famous Nuer prophet, lived between c.1830 and 1906. His father, Bong Can, was a kuar muon (‘earth-master’ or ‘leopard-skin chief’), originally from the Bul Nuer in the west, who came to live among the Gaajok in the east. His mother, Nyayiel, was from the Lou Nuer. Ngundeng was initiated into the Thut age-set in about 1855 and sometime in the 1860s he began to have seizures and was considered mad. He left to settle among his mother’s people, but initially they were no more welcoming than the Gaajok, often referring to Ngundeng as ‘Nyayiel’s fool’. Gradually, however, people began to recognize his strange behaviour not as a sign of madness, but of seizure by Kuoth (God or Divinity), and specifically of the divinity Deng. Throughout his lifetime Ngundeng established a reputation for having the power of life and death. Speaking with the voice of Deng through his songs and prayers he enunciated a social philosophy of peace which condemned inter-Nuer feuds and raids against the Nuer’s neighbours. He constructed a large conical earth mound, or Bieh at Weideang, some five miles north of Waat, which attracted many visitors – Nuer, Dinka, Anuak and others. After Ngundeng died his son Guek claimed to be seized by Deng and took possession of his father’s relics, including the pipe and the dang. By this time the Sudan had been conquered by Britain and Egypt (the ‘Turuk’) and Guek came into conflict with the government. He was killed in battle with the Sudan Defence Force on 8 February 1929. The relics of his father were taken as trophies by the British officers leading the government forces. The brass pipe and a small drum (bul) eventually were housed in the Ethnographic Museum in Khartoum, and were restored to the Lou Nuer by presidential order in 1978. When I first worked among the Lou Nuer in 1975-6 I was told that the dang had been lost in the grass on the day Guek was killed. It was only on returning to England that I discovered that it had been taken by Percy Coriat, the District Commissioner among the Lou at the time (and the first British DC to learn to speak Nuer). It was then in the possession of Coriat’s widow, Kay Coriat. I reported this find to Peter Gatkuoth, a Lou Nuer and the Commissioner of Upper Nile Province when I began my research, and there was naturally a desire among the Lou that the dang be returned to them. Peter reported back to me that when he told Lou elders of this discovery, they claimed they would never be able to live in peace until the dang was returned. When Kay Coriat died the dang was inherited by her daughter, Honor Baines. I mentioned to her the significance of the dang to the Lou, and she agreed that it should be returned. But by this time the civil war was in full swing, with the Lou divided among themselves. As much as they needed peace, it was not possible to arrange its return at that time. Honor Baines eventually got tired of waiting and put the dang up for public auction along with photographs and other mementos of her father in 1999. Alerted to this auction by a former Operation Lifeline Sudan colleague, Alastair Scott-Villiers (who, as a former rare books valuer, kept an eye out for interesting auctions), I bought the dang, with the intention of returning it to the Ngundeng family and the Lou Nuer, to join the pipe and drum, when circumstances permitted. I kept it locked in a safe in my basement for ten years (but mindful that it should not languish on its own without any token of respect, I bought a pouch of Drum tobacco as on offering to Deng to keep it company). A good question, and one that I needed to answer for myself. After emails to various contacts, and trying unanswered (and unanswerable) telephone numbers, I finally made contact with Hussein Mar and had my first telephone conversation with anyone in Bor. I told him my travel plans. More telephone calls later I finally made contact with Riek. I suggested that it would be a good idea if I had a covering letter from him to show to any airline or customs official on the way who might question why I was trying to take a long thin object onto a plane, or into, and later out of Kenya on my way to Juba. ‘You draft it’, he said, ‘and email it to me and I will send you a pdf.’ This done, I had a very faint printout of a signed letter from the Vice-President of GOSS requesting ‘to whom it may concern’ to give me every assistance in returning this historic relic to the Sudan. In the end, I didn’t need it. Almost predictably there was a last minute hitch in the schedule. Two days before I was due to leave for Nairobi (where I was do to attend the final session of a training course for Skills for Southern Sudan, of which I am a trustee) Hussein rang to ask if I could change the date of my arrival. Apparently there was to be a meeting of all the traditional leaders of the South in Bentiu that weekend which Riek had to attend, so could I come to Juba later? I couldn’t really change my travel arrangements at such short notice, but, I pointed out, I would be in Juba for a week, so couldn’t we arrange a hand-over of the dang later in the week when Riek had returned. ‘No,’ Hussein explained, ‘there must be a reception at the airport. It can’t just come into Juba quietly.’ In the end, we kept to my travel schedule, and Riek re-arranged to his own to be in Juba when I arrived. There was also the question of a suitable container in which to carry the dang. It was too long to try carrying on as hand luggage, so it needed a robust container to withstand transporting in the hold of two different planes. I knew that I didn’t want a gun bag, for obvious reasons. Various sports bags available were too short (the dang is longer than the regulation cricket bat). I did locate on my internet searches what I thought was perfect, a hard plastic telescoping cylinder for carrying fishing rods. This I ordered, in what I thought was good time. Well, it wasn’t. My order was logged in just as the firm had sold their last one and they had to re-order from Holland, but I was assured it would arrive in time. When it didn’t I had to follow up with a phone call. Yes, it was definitely coming, but if it didn’t they could offer me an alternative, an American made ‘Bazuka’, which I was assured wasn’t much larger. One or the other would arrive on the day before I left. Well, it didn’t. Calling to find out what happened they said that they never said that I would get it the day before I left, but that they would receive it. This was getting too Sudanese for comfort, and I hadn’t even left for the Sudan yet. ‘Is Deng trying to tell you something?’ Wendy asked. ‘Maybe its not yet time to return the dang.’ Still, I was assured that something would be delivered on the morning of my departure, either the telescoping rod case I had ordered, or the American ‘Bazuka’ alternative. We clearly needed a plan B. While I experimented with cardboard cylinders, Wendy went in search for a duffle bag of a suitable size. She found what she thought was the perfect bag in the local surplus store. Unfortunately, when she brought it home, it turned out to be a sniper rifle bag, complete with pouches for telescopic sights, ammunition, and no doubt even a silencer, if needed. ‘But that looks like a rifle!’ I complained. ‘That’s the last thing I want. I can’t take that to an airport.’ ‘Well, it could be a guitar’, she suggested. We agreed to wait to see what arrived in the morning and use which ever was most inconspicuous. What arrived was not what I ordered or what had been promised in exchange. It was a large black plastic cylinder, taller than me. In shape it looked like a shoulder-held anti-aircraft rocket launcher. You could obviously get a lot of fishing equipment in it. ‘You can’t possibly use something that says “Bazuka Pro Flambeau” on the side’, Wendy protested, and clearly I couldn’t. So, the sniper bag it was. I wrapped the dang in bubble wrap, carefully inserted it into two cardboard poster cylinders, wrapped those in more bubble wrap, inserted the whole in the bag, and bound the lot with ‘Fragile’ shipping tape. Puffed up with all the padding inside the bag did lose some of its military outline. ‘It could be a dulcimer’, my publishing colleague, Lynn Taylor, offered. And since she had lugged a harpsichord across Venice for her daughter’s choir, I had to trust her judgement of the silhouettes of antique instruments. Sniper rifle bags must not be common sights in British railway stations or airports; no one recognizes the potential danger they might contain when they see one. It helped that mine was covered in ‘Fragile’ stickers and bound by a large pink luggage strap, but no one in Oxford station, Paddington, or Heathrow raised an eyebrow or asked to see what was inside. Nor for that matter did anyone raise an alarm as I walked past customs in Jomo Kenyatta Airport, or when checking the boot of the taxi when we got to the Fairview Hotel (opposite the Israeli Embassy), or checking the bag onto the flight to Juba. Either the disguise was entirely effective, or security worldwide is lax. Leaving Nairobi was slightly confusing as there were three different flights to Juba, all scheduled to leave at 10 am from adjacent gates at JKA. I imagined that there might be a mix-up in the baggage, so that even if it all arrived in Juba, it might be on the wrong flight. Ours was the last to take off, and did so early, rather than late. It was almost empty and had I known this, and been persistent, and waved Riek’s letter, I might have been able to bring the dang on board with me. But had I done so, it would have reduced the spectacle when I arrived. I still wasn’t sure that there would be a reception for the dang at Juba airport, and even if there was, what sort it would be. Would it, for instance, be held decorously inside the VIP Lounge, where visiting dignitaries and heads of state were received? A few sort speeches, a formal handing over, some Ngundeng songs, a photo opportunity? There was a small crowd outside the VIP lounge as we landed, and some official cars drove up with lights flashing and sirens as we taxied towards it. The other passengers on the plane speculated what this might mean, some thought it might be Salva leaving for somewhere (In fact it was the arrival of former South African President Thabo Mbeki and an AU peace mission. Riek, as VP, was there to greet him, but as our flight arrived early, he apologised and had to cut the greeting short: ‘Ah, the Nuer Cultural Event’, Mbeki remarked, as he was handed on to the GOSS Minister for Cabinet Affairs). By the time I descended from the plane a few more pick-up loads of people arrived, unfurling banners praising Ngundeng and welcoming the dang, so I knew that a reception had at least been announced and would be held, if not quite planned, on the tarmac. I at last saw a familiar face as John Luk, GOSS Minister of Energy and Mining, headed an official group to greet me. He proposed to lead me toward the terminal, but I suggested that it might be best if we retrieved the dang from the cargo hold of the plane before going ahead with whatever official reception was planned. As we turned around and headed for the other side of the plane where the cargo was being unloaded there was a great shout and the crowd of Nuer who had gathered outside the terminal surged around the back of the plane and surrounded the baggage cart, craning their necks to look into the cargo hold. When one of the luggage handlers shoved out a long thin cardboard box there was another cry and ululation as people excitedly began clambering onto the cart. ‘That’s not it’, I shouted, but by this time I had been shoved to the back of the crowd (which was going to be my frequent vantage point for much of the day). SPLA police struggled to form a cordon around the cart, and someone led (and pushed) me to the open cargo hold so that I could retrieve my luggage myself. I found the sniper bag and pulled it out. ‘Is that your only bag?’ I was asked. So I pointed out my suitcase (also black, but short and squat, and bound by a maroon luggage strap), and these were both shoved to the front of the cart and I was helped up onto the back. By now there was a very large crowd of Nuer surrounding the plane. I held on to the sniper bag, not quite knowing what to do with it, when Riek strode through the crowd, in suit and tie, a white ostrich plume pinned to his safari hat, and carrying a short decorative aluminium spear (with a blunted point). A little behind him came Gabriel Gai Riam, my former research assistant, and I was relieved to see him there. I handed down the sniper bag to Riek and shook hands with Gabriel. Riek raised the bag to yet another great shout and strode off. Someone else followed him holding my suitcase aloft. By the time I had got down from the cart the crowd had cleared the plane and was heading, not for the terminal building, but around it, and for the car park in front. It seemed to me that the crowd was in danger of splitting to follow two similarly coloured, but quite different containers: the sniper bag with the dang, and my suitcase, with my clothes. I followed, falling further and further behind as people stopped me to shake my hand. ‘Are you Douglas?’ they would ask, and then ‘Thank you!’ Some even wanted to explain to me why it was important that I had returned the dang. 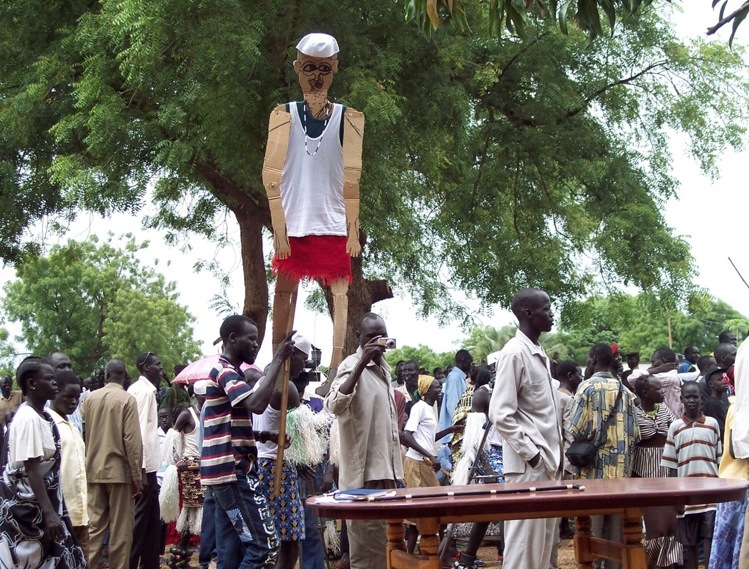 I passed Skye Wheeler, the Reuter’s correspondent, as she was interviewing a young man wearing a cardboard sign proclaiming ‘Ngundeng Bong for Southern Sudan’. I greeted Skye, but she kept up with her interview before breaking off to try to interview with me on the hoof, which was difficult to do, not because I was hoofing it at any great speed, but because the young man with the cardboard sign wanted to explain to me why it was such a good thing that the dang been returned. We were driven to the new VP’s ‘palace’, a one storey building within a compound still under construction, where we then sat in one air conditioned sitting room, with the sniper bag on a table in front of a couch. Two very tall Nuer men, dressed in jallabiyas and wearing civet cat skins (there wasn’t a genuine leopard skin to be seen all day), stood in front of the couple singing Ngundeng songs. They seemed intent on singing the whole Ngundeng canon until Riek called a halt and we were all able to sit. We had outstripped the crowd at the airport and waited inside as they caught up with us. Gabriel finally came in, but Hussein Mar was still in Jonglei sorting out the peace agreement between the different counties in Jonglei (he did show up later that day, but only after the day-long ceremony was over). One person I hadn’t expected to see was Michael Mario, who had been Peter Gatkuoth’s secretary when I started my research, and whom we last saw in Bor in 1983 on our way to Malakal, when he was Commissioner of Jonglei Province (as then was). His main responsibility towards me in 1975 was forwarding my mail when I was in the field. He was obviously still impressed by the volume of letters my mother sent me, because he asked after her! As we waited for the crowd to reassemble I watched through the windows small boys carrying cartons of water bottles on their heads for the people outside (the arena would be littered with empty plastic water bottles by the end of the day). We could hear drumming, bugles, and cowbells, as more people arrived. Finally, when enough of a crowd had assembled, and the audio and video equipment were in place we processed along concrete paths to another part of the compound, a large square which was really a waste ground of discarded building material. As usual, I trailed behind the main procession led by Riek with the sniper bag. We were then seated in chairs and sofas underneath some shade trees, Riek and Angelina together on a sofa rather like royalty, with the sniper bag on a coffee table in front of them. What followed was neither choreographed nor entirely scripted, but a visible demonstration of the ‘ordered anarchy’ about which Evans-Pritchard wrote so evocatively. Without suggesting in any way that there was a religious frenzy in the day’s proceedings, I would say that persons and groups performed according to the Quaker phrase, ‘as the spirit moved them’. During the speeches if someone was moved to sing or dance, they did so, and others joined in. Two dance troupes of young men, dressed in football shorts and jerseys, carrying bamboo sticks and painted pointed metal shields (of what I would have said was a Shilluk pattern) competed with each other, dancing in lines the way the Lou do, and holding mock spear fights. One group with brown shields had been dancing outside Riek’s ‘palace’ and accompanied (and preceded) the procession to the makeshift arena. Another group had black shields with ‘Maale’ (the common Nuer greeting) painted in large white letters, along with an anti-AIDS slogan superimposed on an SPLA flag. These were members of the Maale Heritage Development Foundation. Their duels with the bamboo sticks amused the crowd, especially when one of the duellers slipped and fell to the ground and had to scramble out of the way as his opponent kept on jabbing with his stick. Their founder, a young man named Deng Nhial Chiok, was dressed all in white (shirt, trousers, and shoes) and had draped a leopard-skin print cloth over his shoulder, ‘kuar muon’ style. He acted as the MC throughout the day. Various GOSS dignitaries arrived at different times, among them: Luka Biong, Minister for Presidential Affairs (who couldn’t stay), Martin Elia Lomoro, the Minister for Parliamentary Affairs, Gier Chuang Aluong, the Minister for Telecommunications (whose Baptism at Juba Cathedral I attended in 2007), Dr. Joseph Monytuiel, the Minister for Health, and D.K. Matthews, the old reprobate, who was the oldest ‘elder’ there. Absent was Salva Kiir, who was in Bentiu, and Albino Akol Akol, the Minister of Culture, who was in India. Those who gave speeches frequently had to speak over spontaneous singing, or compete for attention with the impromptu dancers, both male and female. The announced entertainment was also interrupted by the unscheduled arrival of new groups. Dinka dancers from Aiwel and Warrap States arrived unexpectedly, and the proceedings were interrupted as they were identified and announced. The Aiwel troupe carried a life-size cardboard figure of a khawaja dressed in undershirt and tattered shorts, with articulated limbs which they made to dance by jiggling it rhythmically . This was a representation of the white man returning the dang. (‘I think that’s supposed to be you’, Gabriel laughed, when it was announced). A couple of dancers also wore black fringe beards tied around their chins. They were a little confused about what was being returned because they also carried an outsized blue cardboard spear. Whether this was supposed to be satirical or not, everyone seemed to enjoy the joke. They danced vigorously, their arms raised to represent widespread horns, and stamping their feet, one ankle of each being tied with rattles. Riek enjoyed this very much and got up to face them, stamping his feet, too. In fact, Riek frequently danced. When he liked a dancer or a singer he got up and waved his hand over their heads. This meant that we all got up and did the same (it seemed impolite to stay behind, so I trailed along and waved my hand and clicked my fingers, too). One group of women came up waving the bamboo sticks and shields they had borrowed from the men, so Angelina took Riek’s aluminium spear and joined them, and Riek soon followed. I could just see the ostrich feather on his hat bobbing above the heads of the women as they surrounded him. There were many speeches, by and large in Nuer, with no translation, though many of the speakers slipped in and out of Nuer, English and Arabic, sometimes within the same sentence. Michael Mario gave a brief history of Ngundeng, some of which was correct (he had asked about dates earlier), and then told about the time Gabriel Gai Riam and I had gone to Waat and Weideang, and when I returned some months later my skin was red (or so he said). He even mentioned the pile of my mother’s letters that accumulated on his desk while we were out of Malakal (I know, dammit! He didn’t forward them on to me fast enough). Michael went on at length about how every nation had its history, that the dang was for the whole of Southern Sudan, and the importance of the unity of the South (I turned to Luka Biong at this point and asked him if Michael was still with the NIF. ‘No, he rejoined the SPLM a long time back’, Luka replied). Gabriel gave a more accurate account (in Nuer) of the history of the dang, how it had ended up with ‘NyaKurieth’ (Coriat’s daughter), how I had bought it, and how he, Hussein Mar, and I had planned to bring it back this year. Martin Lomoro gave a speech in Arabic about how the dang was for all people and for peace in the South (Riek was very enthusiastic, ‘That’s exactly the tone we want to strike’ he exclaimed). D.K. spoke, others spoke, finally Riek spoke, and then it was time to unveil the dang. Riek laid the sniper bag on a table in the arena. A white ox was brought out in front of it – we weren’t going to be allowed to escape witnessing this sacrifice. As Riek said, no Nuer had seen the dang for eighty years – except for Gabriel and Hussein when they came to see me. I don’t think anybody stayed put on the outer rim of the arena, and they crowded around the table and us. First I unlocked the sniper bag and then took out the cardboard cylinders. Riek and I then removed the dang from the cylinders, and I unwrapped the bubble wrap, section by section until the dang was fully uncovered. I then handed it to Riek, who raised it in both hands for as many as were able to see. While there was great excitement, I can’t help think there must have been a sense of anti-climax as well. The bubble wrap and sniper bag made it look bulkier. With all the build up about the dang, in the end it is only a long stick, wrapped in copper wire, broken at one end. That, of course, is one proof that it is genuine, as Ngundeng’s dang was broken, and he often referred to his ‘broken dang’ in his songs. Another proof was the shipping label, in Coriat’s hand, which has been on it ever since Coriat brought it England eighty years ago. Anybody nearby with a digital camera or a mobile phone (and there were a lot of them) began taking pictures of the dang. Those near enough touched it, more out of curiosity than reverence, or came up to take a good look at the label. A wider circle was cleared as the ox was pulled further away from the table and then pulled down to lie on its right side. They were taking no chances in seeing which way it might fall. Riek had tapped it with his blunt spear, but it was slaughtered in the Muslim way, by slitting its throat with a knife. I have no idea whether this is a new modification of cattle sacrifice, or whether it was done so on this occasion to enable any Muslims present to share in the meat. There was such a hub-bub I thought there could be no further speeches, but we still had two to go. The microphone was handed to me. I kept it short, with Gabriel translating, though that didn’t seem to be needed as there was applause (at least from some parts of the audience) before the Nuer translations. In sum I said that I was glad to have played some part in bringing the dang closer to home. It wasn’t home yet, but it would be brought back to Waat and Weideang (cheers). The dang now belonged to the Naath and the Janubiyin (more cheers). The dang had been removed in a time of war, but now it was a time of peace. This was the time for peace and reconciliation. Though peace had come there was still fighting in the South and I hoped the dang would play a role in bringing that fighting to an end, building peace and fostering reconciliation (even more cheers). Riek’s final speech was more nationalistic, claiming that Ngundeng had foretold the emergence of an independent Southern Sudan, the 2011 Referendum, and more along those lines. He then praised me rather extravagantly for all the things I had allegedly done for the South (much exaggerated, but it makes a change from what the government’s hired guns said about me at The Hague, though in fact I suspect they would think that this all rather proved their accusations), and promised that when the dang was returned to Weideang I would be invited to come. He also pointed out that it was no coincidence that the dang was returned on the 16th of May, the anniversary of the beginning of the revolution (though in fact it was a coincidence), and that it was sad that Kerubino, William Nyuon and John Garang were not alive to witness it (since all three ended up trying to kill each other, it would have been a real test of the dang as an instrument of reconciliation had they all been here). The microphone we had to use was one of the ‘roving’ types, and with so many people behind us the signal kept on being broken. Riek later complained that he had a lot more to say, but the microphone kept on failing him. Perhaps it is just as well – with a more reliable sound system Riek might have been inspired to declare unilateral independence then and there. He had another chance, and I was told that he expounded on the dang for forty-five minutes when he returned to Bentiu and addressed the assembled chiefs there. With the ceremony now over, and the dang back in its sniper bag and in Riek’s hands (‘Its no longer my responsibility’, I said to him, ‘but yours’) we then made our way back to Riek’s ‘palace’. Again my progress was slow as people either wanted to shake my hand or take photos with their mobile phones – though I doubt these Juba-style paparazzi are likely to get much for their snaps of a tired, elderly ‘Turuk’. A South Sudan TV crew stopped me and asked if they could interview me ‘for two minutes’, but promised they would let me get back to the house before they did so. They were young men and fit, so in spite of having to lug a video camera and tripod they were set up and waiting for me by the time I got to Riek’s house. The interviewer asked, politely, if I was ‘Doctor’ Douglas or ‘Professor’ Douglas, and I told him it was ‘Doctor’, and thanked him for being the only person who had made sure of the distinction. The questions he asked me were well thought out and to the point. I hope I answered reasonably well, but I’ve not seen the interview as the television in my hotel seems to be permanently tuned to satellite channels of football, Nigerian soap operas, or Francophone music videos. The TV in my room doesn’t seem any better at picking up the local Southern Sudan TV channel (though I was able to get the Daily Show). However, at least one guest told me that he had seen me unwrapping the dang on TV. Even though they had some months to prepare for this event, in fact they had only spent the last two days mobilizing a reception. Riek told me later that he had argued for incorporating the return of the dang in the annual 16 May celebrations, but it had already been decided to postpone the formal celebration until 26 May as many of the SPLM/A’s senior people were already in Bentiu for the pan-Southern traditional leaders conference. But (as Wendy later pointed out to me) community groups would have already been preparing for some demonstration on the 16th, and it is likely that some of these were primed to show up somewhere and perform on the day anyway (though I can’t imagine that the Aiwel State’s khawaja effigy could possibly have been prepared to celebrate the Bor Mutiny and the founding of the SPLA). The dang seems to generate its own stories. ‘Is it true what people are saying,’ Deng Nhial Chiok asked me the other day, ‘that the family in England who were keeping the dang have had a lot of deaths, and this is why they have now released it?’ Everyone dies in time, I replied, and those in the family who have died did so at an age when it would be expected. Not everyone is pleased to see the dang brought back in such style. There is already internet chatter (mainly from the diaspora, you can tell from their crude adoption of Black American slang) some quite tribalistic, others religious. Conspiracy theories have been aired that Riek wants to use the dang to become GOSS President, because Salva will die if he touches it (and Salva’s absence in Bentiu will only fuel those theories, I suspect, though in fact he also announced the return of the dang in a speech to assembled traditional leaders that very day, and later in Juba at the delayed SPLA Day celebrations). Some Christians are denouncing it all as witchcraft and idolatry – though Christians were there to greet it, most notably my old research assistant, now Reverend Gabriel Gai Riam. One descendant of Ngundeng’s who is Paulino Matip’s office manager complained that Riek has poiticised the dang. His real complaint is that it should have been given to him, and the rest of the Ngundeng family have now firmly sat on him. It is inevitable that the dang will enter the mix of Southern Sudanese politics. But Ngundeng’s songs and prophecies are notoriously difficult to tame. The first prophecy I heard, in 1975, was that there would be two civil wars and the second would be worse, but shorter, than the first. That prophecy turned out to be only half right (and the worse half at that) – so either Ngundeng got it wrong, or those who interpret him got it wrong. When Skye Wheeler asked me if was true that Ngundeng, who was left-handed, foretold ‘a leader’ like himself in the future (as many supporters of Riek, who is also left-handed, claim), I pointed out that a number of persons had been identified as that leader in the past, and in fact the left-handed Obama fit the description as well as any. An intriguing thought. Maybe I should spread that around. Douglas H. Johnson, Nuer Prophets (Oxford: Clarendon Press, 1994. Douglas H. Johnson, ‘The prophet Ngundeng and the battle of Pading’ in David M. Anderson & Douglas H. Johnson (eds), Revealing Prophets (London: James Currey, 1995). Douglas H. Johnson (ed. ), Governing the Nuer: Documents by Percy Coriat on Nuer History and Ethnography 1922-1931 (Oxford: JASO, 1993). Previous Previous post: Is South Sudan drifting towards famine? Excellent account, thanks Douglas for returning this historic piece “the dang” back to its people. Thanks Martin for blogging this great story. The Ngundeng prophecy. Peace is much needed to explore the rich land of the Sudans. There was a second ceremony a few months later, attended by Salva Kiir, the entire cabinet and former warlords Paulino Matip and Peter Gatdet (who made a speech and sacrificed an ox in the traditional way). The President instructed the Ministry of Culture to make final arrangements for the return of the dang to the Lou Nuer, but Riek never relinquished it. This was something that upset many Nuer, and I used to be stopped in the street in Juba by Nuer asking me if I could do something about it. Many of the current “prophecies” being applied to Riek are recent inventions. Ngundeng was bearded (something unusual for Nuer at the time) and also left-handed, so contemporary references to bearded and left-handed men refer to him. Many thanks to Douglas for keeping in mind that the historical Rod must be return to it people to bring peace to the Country long civil war ended and the short civil war is now on. That war will not last long. Pingback: What are the Prophecies of NGUNDENG BONG, the Lou Nuer Prophet? | PaanLuel Wël: South Sudanese Bloggers. But please you have created an evil that will stay for long in South Sudan. We in the country absented ourselves from traditional religion but those of Riek Machar need to take us back in future. I can blamed you that what you have created in the country is bad and we will not be forgotten sir. it seem that your support to this crisis is more involve in this suffering. Many did not know what prophet Ngondeng says Riek Machar or other SPLA members because Ngondendeng talk to me many times about leaders of South Sudan but he not mentioned any thing about Riek Machar as a next leader of South Sudan. What Ngondeng told me in a vision on 27th July 2005 is that Inform Lou community that do not for the death of John Garang death that will soon and he says that Deng Kur will come to select a leader ffor the people of South Sudan in which Salfa Kiir was selected immediately after the of John Garang on 30th July2005.Regarding the Rod it is not for any official in South Sudan to carry it ,so the same rod(Dang) it is the one causing problem to Riek Machar and the people received Rod(Dang).in Juba. It was supposed to taken Wicdeng where it taken and people Wicdeng knows how to receive according to their tradition. 1. very strong bearded man will over the power and nation. 2. man with left hand will also rules the nation. we have salva Kiir who is bearded and he is the one who lead the nation; and Riek machar as left hand man. so I think left hand man will never be occupied this, bcos, it is not his time, this time belong to bearded man as u have seen it. but left hand man has started his mission early but it is not his times. the time belong to bearded man.